Racism can be like wallpaper. It is just there. Accentuating the space, defining its partitions. In how many ways could a pattern be described? I would rather not write about it. I am as tired of it as others might be of hearing from me, and people like me, about it. This is the claustrophobia it engenders. It is true that not everything is about race; there are class and gender. Words are still only words on the scale of bad things that happen to people, and there are arguably more pressing issues than majority-minority panics about (white) identity. I would prefer not to lend racists attention. The planet is burning. Life is unacceptably precarious: for children in detention, women in violent homes, disabled people on welfare, homeless teenagers. The federal government handed almost half a billion dollars to a foundation with six full-time staff, unsolicited and without competitive tender nor due diligence. These are things worth attention. But this is how racism works: it displaces focus from material problems to imagined threats. It reframes complex problems for political capital and sometimes violent ends. That is the point when it stops being just wallpaper but also the scaffold. Not decoration, but a cage. I live in the outer west suburbs of Melbourne, where people have converged from places like China, India, Myanmar, the Philippines, New Zealand and South Sudan. This mix becomes apparent during school pick-ups. The bell would ring, then a chattering swell as students pass the gate. I picture this and other scenes when the rhetoric turns heated. The tall, slender mums pushing prams. The girls in hijab behind the fastfood counter. The bearded men reading the newspaper at the library. "I did not realise that I had been holding myself together until Anning's speech. But in a momentary lapse, I let myself feel the bewildered resentment that comes with having to be resilient." Some distance from the tumult of so-called debate, what becomes clear is that people just want to live their lives. Nothing much more profound than this can be extracted from the mundane. They do not mean to make others panic. Yet they will not be left alone. In the past month, Prime Minister Malcolm Turnbull and Home Affairs Minister Peter Dutton were still insisting that there is an African gang crisis in Victoria. Multicultural affairs minister Alan Tudge mulled strict tests for non-English speaking migrants, based on the mistaken belief that they fail to 'integrate'. In the same period, Sky News ran a soft interview with a Hitler-loving ethno-nationalist. Media personality Andrew Bolt asserted that 'there is no "us" any more, as a tidal wave of immigrants sweeps away what's left of our national identity'. In similar vein, Queensland senator Fraser Anning declared in a chamber of Parliament that, 'we as a nation are entitled to insist that those who are allowed to come here predominantly reflect the historic European-Christian composition of Australian society.' He invoked both White Australia policy and the Holocaust in an unequivocally anti-Muslim speech. I did not realise that I had been holding myself together until that speech. But in a momentary lapse, I let myself feel the bewildered resentment that comes with having to be resilient. These things take up mental bandwidth, and with enough years being made to feel like my presence here is permanently conditional despite citizenship, it can take a toll. I don't have to be in the latest group being targeted; it is enough that every targeted group has been not-white. It bears noting that dog-whistling, if it could even still be called that, is directed not just at like-minded people but at those it means to diminish and intimidate. It puts the lie to rhetoric about integration. Politicians and commentators in Australia routinely characterise non-white Australians in terms that make them feel like they will never belong. Then having contributed to that alienation, use it against those they have alienated. That is also how racism works: like a noose. Anning's speech was heavily criticised, though few who did so bear credibility. Turnbull, Dutton and Tudge can hardly be taken seriously when they invoke multiculturalism. Pauline Hanson condemned Anning, even as she expressed interest in the idea of a plebiscite on migration levels. Cory Bernardi said he agreed with 'a lot' except that he knows 'there are phrases that are quite sensitive that can be exploited by your opponent'. Anning's party boss Bob Katter called his speech 'absolutely magnificent'. This could all still just be wallpaper. Or maybe it is just time to tear this rotting house down and start over. Hang in here, Fatima. Australia needs you! I disagree with much in that speech - but it did not invoke the Holocaust - despite the use of a phrase that can refer but does not at all necessarily refer to the Holocaust. And it does not help by using subjective, offensive descriptions of those who have different, politically incorrect, views. And it does not help to associate with some of the statements in this speech those such as myself and a vast number of others who believe immigration here must be greatly reduced, or that there should be realistic, sensible discrimination as to who are admitted, or those such as myself who do not believe in the dogma of "multiculturalism", and those who believe the development of quasi-ghettoes in parts of Sydney and Melbourne is not always healthy. I meet and work alongside many fine Muslims every week - the majority- but I also know of the kind of thing that has not been uncommon in a nearby suburb with a Muslim majority : the posting of signs along a street telling of the coming Caliphate, the spitting on Christian clergy, the firing into a church window, the slashing of car tyres outside a church, the fire-bombing of the flat of a friend with a life-long disability. But few of the commentators live in such areas or working class suburbs (such as mine) and listen to people - not racist or extreme - who feel they too are silenced. Penny Wong was her usual wonderful self. Malcolm Turnbull seemed for a moment to be a man with backbone. We were reminded that one man represents us in parliament only because he received 19 votes. Now, having located their ethical selves, will parliamentarians stop looking at climate change through the lens of power-bills and consider the future of this fragile planet? Firstly, I hear you Fatima. Thanks for this article. Secondly, I'd like to offer a reply to John Bunyan. When we choose to catalogue the wrong-doings of a particular group of people and call for their separation and/or elimination we are journeying to a place of darkness. There is no place in a just society for racism and intolerance. Wrong-doing needs to be called out, it needs to the fixed in a way that leads to everyone in society being valued. Fraser Anning's speech was reprehensible and was rightly criticised by the PM and Leader of the Opposition. "He invoked both White Australia policy and the Holocaust in an unequivocally anti-Muslim speech." This type of false hyperventilation is where you lose people. Yes, anti-Muslim which is indefensible, but the rest is just fake news. Nothing about people's colour and final solution reference tin-eared but undoubtedly just ignorance. Anning's speech, along with Katter's endorsement, not only caused me shock and embarrassment, that they are fellow Queenslanders, raises a barrage of hatred and exclusiveness that in my opinion brings grave harm to our society. Fatima's article brings up the tears I almost shed along with anger at hearing Anning's words. And amazement when not a few parliamentarians rose to shake his hand? A number of commentators have made the worthwhile clarification of the need to separate concerns within the wider community on immigration numbers and policy, fostering harmony in our multicultural society, national population size policy from the issue of discrimination based on race, religion and ethnicity. Discussion on the former to be encouraged, the latter to be condemned for the evil that it is. Lack of leadership or failures in national leadership creates the opportunity for those on the fringe of our political spectrum to inject their fears and hostilities into the broader debate, as we have just heard. Our leaders need to reclaim, through ongoing actions, the vision of a multi-cultural Australia. I find the last sentence , "Or maybe it is just time to tear this rotting house down and start over," needs to be clarified. As it stands it is open to speculation. A few quick points. True, John, it could be argued that the phrase 'final solution' does not necessarily refer to the Holocaust, but that's the way that all dog-whistles work. The target audience knows that it does whilst the user can plead innocence. Secondly, John, that throw-away line of yours about 'work[ing] alongside many fine Muslims... but' sound a lot like 'some of my best friends are Catholics... but'. Thirdly, if you are so concerned about signs announcing the 'coming Caliphate', I presume that you would also object to 'Mashiach is coming' in Melbourne and 'Jesus is coming' signs in Queensland? Totally agree Pam and comments like John Bunyan's should always be called out for what they are, divisive. To take them to their logical conclusion we should ostracise Catholics and limit their influence in Australian society because of the institutional and documented pernicious impact religious clergy have had on so many young people in Australia. As one of those documented survivors of such abuse, I certainly don't call for this. Thanks Fatima, I totally agree that people in public office need to show leadership and instead highlight the substantial contribution immigrants have made to every generation of Australians and will continue to do so into our future. Its so ironic that so many Australians are recent immigrants themselves and then want to shut the door on the next wave of migrants! Anna, Senator Anning was not elected because he 'received 19 votes'. He is a Senator because because about 200,000 electors, in Queensland voted for Pauline Hanson's One Nation party and another roughly 200,000 preferenced it ahead of other candidates in the 2016 election. Anning may be a weirdo, but he is not there because he has the support of only 19 Queenslanders. That's the scary bit. Another excellent article, Fatima - thank you, and I'm so sorry for what you have to deal with. I can understand your frustration on hearing Fraser Anning's speech., Fatima. We live in a multiracial/multicultural society and speeches like this do have a negative effect on national unity. I was born during the last 2 years of WW2 and as a boy, I remember the bigotry from some Anglo Saxon Australians towards Italians, Greeks , Germans and some other groups of refugees. Bigoted people try to stereotype people from other races and sadly, all racial groups have such people. The claim that we are a white society and need to reintroduce the White Australia Policy is an incredible nonsense! The British Invasion occurred just over 200 years ago, but before that there was a 60,000 year period of Aboriginal occupation of Australia. The attempts at genocide by the occupiers caused a huge number of deaths and human suffering, but they did not succeed. I find it morally offensive when conservative politicians play on the fears of people who are nervous about multiculturalism and try to use this to gain a political advantage as some have done with Muslims, African ethnic gangs and asylum seekers. However, it is positive to see good people taking a stand and speaking out when politicians and others promote discrimination. For those who would like to think that Senator Anning is just a frightful aberration that will go away at the next senate election, think again. The more than 400,000 electors who returned two One Nation senators at the double dissolution election in 2013 will be sufficient to return one senator at the next half-Senate election in 2016. Hanson herself will not be standing so it's quite possible, and arguably highly probable, that those 400,000 votes will be garnered and/or filter through to Senator Anning at the top of a KAP ticket. Thanks for drawing attention to Senator Anning’s maiden speech, Fatima. At least he didn’t propose the Idi Amin solution. Given that across Western civilization, the self-important hard left subjects every public utterance to unrelenting censorship, I think it would be helpful if we were given a practical signpost to point Australia in a more acceptable direction. First, I suggest nominating a non-Western country (preferably a Middle-East country) from the 193 country membership of the UN that represents a practical example of community love and inclusiveness that Australia should accept as a model? Please just name one! Two years ago the author Lionel Shriver was virtually hounded out of the Brisbane Writers’ Festival because she, a white straight women, dared write a black character into her work. Yassim Abdel-Magied, who enjoyed a highly paid taxpayer position with the Government, reportedly was asking, ‘How was it that Shriver was allowed to speak? 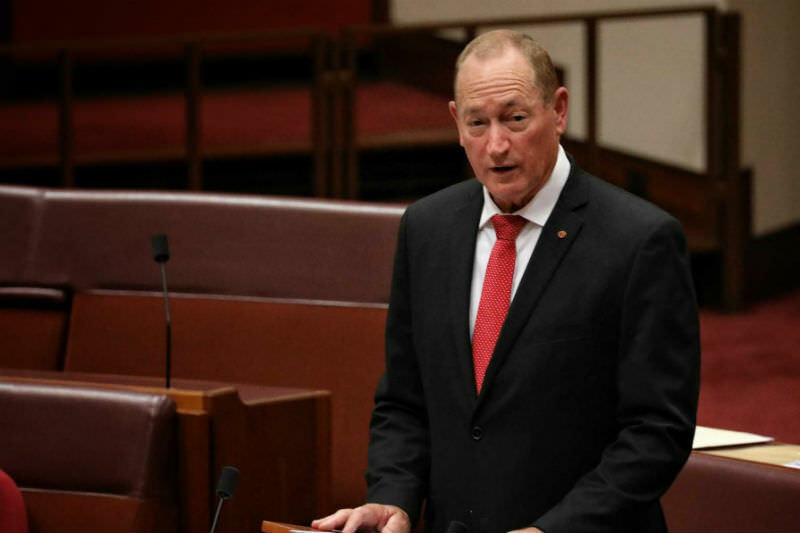 Rather than hyperventilate over Senator Anning’s expressed thoughts, it might be productive to consider why such views find expression in the Australian community in 2018. I recommend reading a piece by Peter Baldwin, Minister in the Hawke and Keating Labor Governments in the Weekend Australian of 17-18 September 2016. Dear Fatima, I sympathise with your distress and wish things were different in this country. When I was growing up we thought Australia was a fair country though we were still very racist without realising it. Now there are times when I feel ashamed to be an Australian, because of the attitudes of most of our parliamentarians. I agree Brian b. that it 'might be productive to consider why such views find expression in the Australian community in 2018' and so I'm keen to read the article by Baldwin. But as the Weekend Australian is behind a paywall, perhaps you could give us a précis of the article or a free-access link to the original? Barren trees produce no good fruit. Ginger Meggs, to be honest I am unable to devote the time to constructing a precis that would do justice to Peter Baldwin’s article. Many Australians have a mixture of left and conservative attitudes. Peter Baldwin positons himself as a moderate leftist in the social-democratic tradition. If the Eureka Street Moderator allows, I will outline some key thoughts of Baldwin: ‘I think of regressive leftism as a mind virus, a paralytic disease that is severely inhibiting the ability of Western societies to properly debate some of the most important issues they face. It is suffused with self-loathing – severely condemnatory of ‘white’ post –Enlightenment Western societies yet prepared to overlook or apologise for the most egregious defects in other kinds of societies… Consider the enormity of the transformation Europe is undergoing (with the effective dissolving of the external borders with North Africa and the Middle East) and imagine how Europe will look in several decades if this continues. Yet Europe’s elites seem incapable of conducting an honest debate about the implications since it would involve asking some tough questions about whether Islam, with its undoubted violent and supremacist aspects, is ultimately compatible with liberal societies. Some of Europe’s leaders actually seem reconciled to the prospect of large parts of Europe becoming Islamised…..what prospects for gays’.